When Michael Okun, MD ’96, and Cindy LaRoe, MD, met for dinner with their spouses in 2015, it was a chance for the two former roommates to catch up. They had lost touch since sharing an apartment while residents at UF Health Shands Hospital 20 years earlier. Both could recall Okun’s habit of leaving empty pizza boxes stacked in the kitchen like a teetering house of cards. It is a memory LaRoe has held onto like a rare collector’s item because, unlike so many glimpses into her past, it didn’t vanish after she suffered a head injury in a cycling crash in 2011. LaRoe was diagnosed with a traumatic brain injury and she no longer could practice internal medicine. She also was forced to give up her other life as a champion cyclist in the female 50-54 division. For Okun, chair of the department of neurology at the UF College of Medicine, seeing the effects of a brain injury on his friend and onetime colleague had a “profound effect” on him. But when the evening ended with the couples touring UF’s Center for Movement Disorders and Neurorestoration, the facility Okun co-founded, it was LaRoe and her husband, Ken, who were profoundly impacted by what they saw. “They were just blown away,” said Okun, co-director of the center. That moment inspired Cindy and her husband, Ken LaRoe, founder and chairman of Orlando-based First GREEN Bank, to reconsider where their new foundation, The Art of Medicine, could do the most good. The Art of Medicine Foundation represents Cindy’s love of painting for therapeutic purposes and her devotion to healing. The foundation’s inaugural gala in 2015 raised nearly $180,000 through auctions of items that featured artwork by physicians, including Cindy, an avid painter since her accident. The money went to support brain injury programs in Central Florida. This October in Orlando, the foundation’s gala will support a new beneficiary — the UF Health Trauma, Concussion & Sports Neuromedicine, or TRACS, program. Founded last year, TRACS operates out of the movement disorders center and is affiliated with the Evelyn F. and William L. McKnight Brain Institute of UF. The institute will match The Art of Medicine Foundation’s contribution to TRACS up to $150,000. That “incredible team of doctors” includes TRACS founder and director Michael Jaffee, MD, and Steven DeKosky, MD ’74. Renowned as an expert on brain injuries and sports concussions, Jaffee, chief of the division of general neurology, developed groundbreaking practice guidelines and tools for management of TBI in the military during his service as national director of the Defense and Veterans Brain Injury Center. He was part of an elite team assembled by the chairman of the Joint Chiefs of Staff and credited with changing the culture of concussion for service members and veterans. He said the LaRoes’ support for TRACS will help it maintain high standards of care while the program grows. The two TRACS colleagues say they’ll attend the LaRoes’ gala as guest speakers. Cindy said her connection with Okun and TRACS has helped her feel like part of the medical community again. 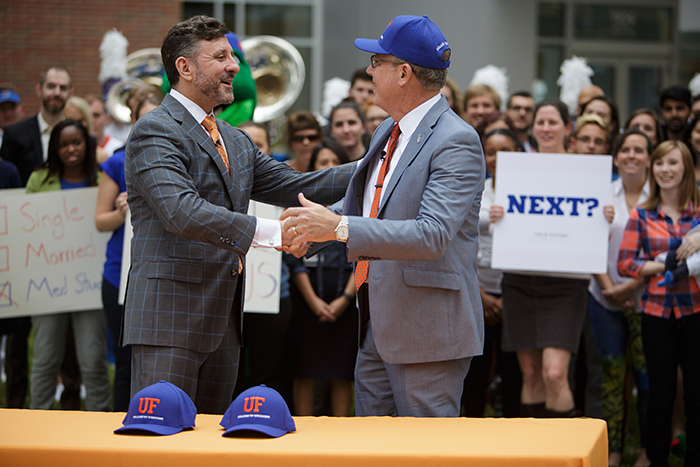 This story originally ran in the Fall 2017 issue of the Doctor Gator newsletter.